The Polynesian Scenario Pack brings you both the Polynesian Civilization and a new Scenario, Paradise Found. 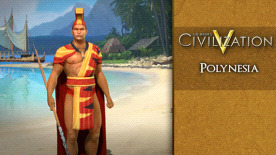 Rule the world as Kamehameha, unifier of Hawai’i, with your powerful navy and imposing Moai statues! Polynesia Ruler – Kamehameha was the first ruler to unite all of the Big Islands of Hawai’i under his rule in 1791, and reformed many of the island’s laws to protect its people. Because of his strong rule and wise policies, Hawai’i remained an independent kingdom long after Kamehameha’s death in 1819.